Visit BGO Live Casino now! BGO Live Casino is an online casino primarily focused Bingo games, but also offers many other games for online casino players. This celebrity-themed online casino shows a less serious side of online gaming. You will be asked to “beat the boss”, and compete with the well-known actor of, among others, mini-me in Austin Powers. Chances are that you’ve seen quite a few commercials from BGO in the UK, as they’ve grown exponentially in regards to television marketing in the last few years. This online casino is also focused on the furture, with their Casino of the Future exploration. Here they discuss and evaluate the possibilities of online casino in the future. Naturally Virtual Reality is mentioned here, and you can see how BGO is constantly looking for new ways to innovate and improve their gaming possibilities. 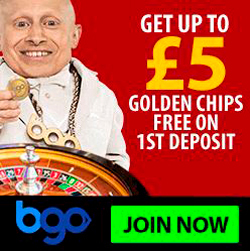 BGO Live Casino with up to £5 Golden Chips! What can you tell me BGO Casino in general? How does the Live Casino of BGO Casino look like? What is BGO Casino latest Welcome Bonus? BGO is another online casino that is relatively aimed at UK players. The casino has a simple overview and operates rather quickly. “The Boss” is, as a mascot, ever present in the online casino animations, and make this online casino somewhat more personalized than most modern casinos. From online bingo and Vegas style slots, to live roulette and Hold’Em poker, there’s a wealth of online casino games to play and win with. The BGO Live Casino website is owned and operated by BGO Entertainment Limited. Copyright © 2017, bgo.com. All rights reserved. BGO Entertainment Limited (Company No. 1839), Inchalla, Le Val, Alderney, GY9 3UL is licenced and regulated by the Alderney Gambling Control Commission. Gambling services provided by BGO Entertainment outside of Great Britain are governed by its Alderney license issued under section 7 of the Alderney eGambling Ordinance 2009. BGO Entertainment is also licensed and regulated by the British Gambling Commission. Only gambling services provided by BGO Entertainment in Great Britain are governed by its license issued under the UK Gambling Act 2005. We see more and more casinos emphasising the importance of responsible gaming. BGO also wants you to enjoy your games responsibly! Bgo.com supports responsible gambling clearly on their website. They claim that it is imperative that all players enjoy playing the games and do not gamble with amounts that they cannot afford to lose. It is with this in mind that we provide plenty of information for all players on responsible gambling and how to spot the early signs. So how can you keep it fun at BGO? Check out their responsible gaming page for more information. The website uses a very simple but effective live chat. You can chat to a helpful advisor 7 days a week, between 8.30am and Midnight, simply by clicking on ‘Open Chat’ which opens a new screen with the chat. You can also send them an email or check out their FAQ page for simple queries. If you’re looking for the most realistic experience possible, BGO Macau from software provider PlayTech is likely where you’ll want to be. This section features live blackjack, baccarat, and roulette streamed 24/7 from a professional studio via webcam. Special interactive features and flexible betting options ensure that all types of players can enjoy these live casino games. PlayTech offers an impressive range of live casino games, but the quality is unfortunately less impressive. The live dealers all stand behind the tables and welcome you to the table. They offer ten different versions of games, such as live Hi-Lo, of 7 seat Baccarat, or Live Casino Hold’Em. The blackjack tables all include the same stakes, with unlimited blackjack as the variety bringer. The blackjack tables are all named after mythical characters, with no further explanation of the table. Since all the tables are the same, except in different casinos or studios, this doesn’t make much of a difference. The live roulette games at BGO Live Casino has an offer of about 18 tables, which is relatively high for a live casino. There are several types of games: European Roulette, Speed Roulette, Auto-Roulette, UK Roulette, but also specialized games such as Age of the Gods live roulette. This AotG live roulette includes four progressive jackpots and is themed after the Playtech videoslot Age of the Gods. Receive up to £5 chips, wagering free! BGO is most well-known for its focus on Bingo games, but it has extended its focus of casino games to include other categories, such as casino games. The home button is the casino category, with primarily videoslots. There isn’t a sports book or any live betting opportunities, but that might just be what BGO wants, after all, the focused resides in Bingo, which is rather exclusive in comparison to other online casinos. Up to £5 in Golden Chips at BGO’s Live Casino! BGO introduced the vault, hidden in the Bass’ office, where you can find bonuses, for you. Simply fill up your Boost Bar, and every time you unlock a new level, The Boss will drop one of four Boosts into you vault. These Boosts are al wagering free bonuses. You can win the Classic Boost, Mega Boost, Boss’ Boost, and Mystery Boost for a little added excitement. 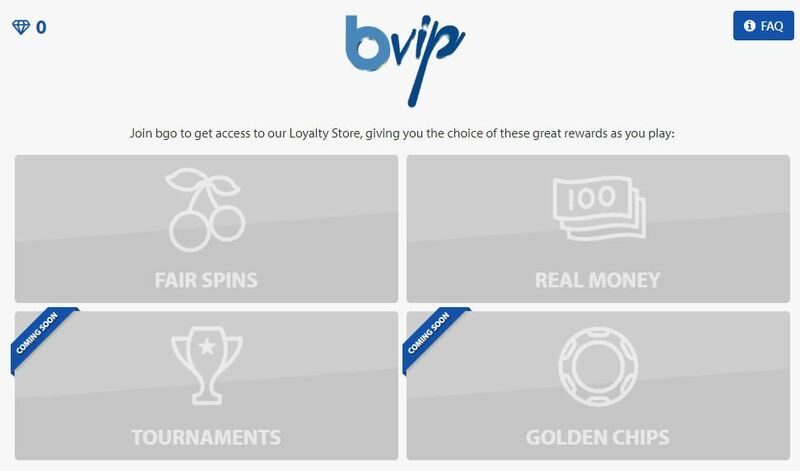 You can make use of the bVIP loyalty store as a form of VIP program. By trading your stars for fair spins (with no wagering requirements), or real cash money, you can use these extras to improve your Boost Bar, and keep playing, but with real money! Tournaments and golden chips are also available here. Live Chat support, Email support. June 29, 2018, No Comments on 10 Free Spins from Paris Hilton at BGO!